EU Referendum: will Vote Leave blunders cost us? 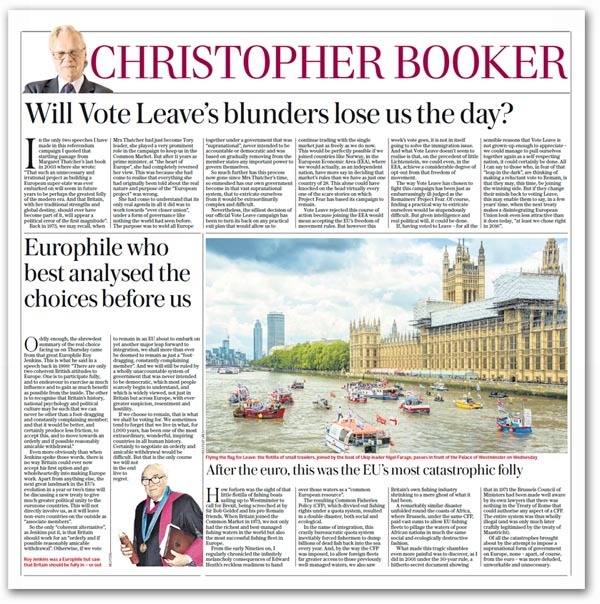 Written before the media incontinence over the murder of Jo Cox took hold, Booker writes in his column today of the only two speeches he has made in this entire referendum campaign – one of them here. In both, he quoted that startling passage from Margaret Thatcher’s last book in 2003 where she wrote: “That such an unnecessary and irrational project as building a European super-state was ever embarked on will seem in future years to be perhaps the greatest folly of the modern era. And that Britain, with her traditional strengths and global destiny, should ever have become part of it, will appear a political error of the first magnitude”. Back in 1975, we may recall, when Mrs Thatcher had just become Tory leader, she played a very prominent role in the campaign to keep us in the Common Market. But after 11 years as prime minister, at “the heart of Europe”, she had completely reversed her view. This was because she had come to realise that everything she had originally been told about the real nature and purpose of the “European project” was wrong. She had come to understand that its only real agenda in all it did was to work towards “ever closer union”, under a form of governance like nothing the world had seen before. The purpose was to weld all Europe together under a government that was “supranational”, never intended to be in any sense accountable or democratic and was based on gradually removing from the member states any important power to govern themselves. So much further has this process now gone since Mrs Thatcher’s time, so enmeshed has our own government become in that vast supranational system, that to extricate ourselves from it would be extraordinarily complex and difficult. Nevertheless, the silliest decision of our official Vote Leave campaign, says Booker, has been to turn its back on any practical exit plan that would allow us to continue trading with the single market just as freely as we do now. This would be perfectly possible if we joined countries like Norway, in the European Economic Area (EEA), where we would actually, as an independent nation, have more say in deciding that market’s rules than we have as just one country of 28. This alone could have knocked on the head virtually every one of the scare stories on which Project Fear has based its campaign to remain. Vote Leave rejected this course of action because joining the EEA would mean accepting the EU’s freedom of movement rules. But however this week’s vote goes, it is not in itself going to solve the immigration issue. And what Vote Leave doesn’t seem to realise is that, on the precedent of little Liechtenstein, we could even, in the EEA, achieve a considerable degree of opt-out from that freedom of movement. The way Vote Leave has chosen to fight this campaign has been just as embarrassingly ill-judged as the “remainers'” Project Fear. Of course, finding a practical way to extricate ourselves would be stupendously difficult. But given intelligence and real political will, it could be done. If, having voted to leave – for all the sensible reasons which Vote Leave is not grown-up enough to appreciate – we could manage to pull ourselves together again as a self-respecting nation, it could certainly be done. For those who fear that “leap in the dark” and are thinking of making a reluctant vote to remain, Booker suggests that this same fear may well carry the day. But in a few years time, when the next treaty makes the European Union look a very different and even more alarming prospect than it does today, at least having voted to Leave will enable them to say “we chose right in 2016”. What the outcome will be, of course, it remains to be seen. And it is too early to judge whether the media treatment of Jo Cox will have any significant impact. But, if the response of the Swedish public to the Anna Lindh murder is any guide, then we will see sense prevail. It would have been that much easier, however, if Vote Leave had adopted Flexcitright at the beginning, instead of its last minute conversion to a shoddy parody of a plan. Perhaps if that had happened, the focus might have been more on the issues than the personalities. If because of that we do lose, I can see an interesting dynamic emerging where Vote Leave seek to use the treatment of the Jo Cox murder as an alibi for its own incompetence. Needless to say, it will be the first to claim the credit if we win, despite having done everything possible to sabotage the campaign. However, a common refrain for no end of people is their disgust at both official campaigns, leaving them to make up their minds in spite of what they hear and see, not because of it. More generally, we hope this is also the response to the emotional incontinence pouring from the print and broadcast media. Win or lose, however, I suspect that politics will never be the same again. This referendum has lifted the lid on British politics and a lot of people have looked inside and have been appalled by what they have seen. There will be no possibility of putting the lid back on and continuing as before. Business as usual is not an option. Previous Previous post: Booker’s Last Sunday Sorti Pre BreXit Vote Is Telling In Tone & Content!